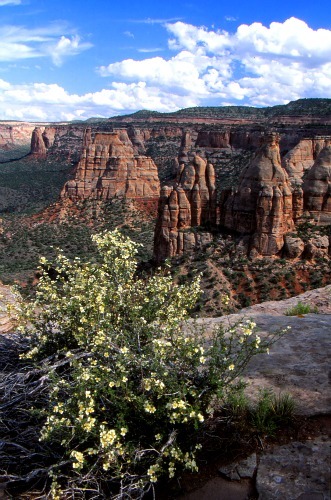 The Colorado National Monument is part of the northeastern section of the Colorado Plateau located between the towns of Fruita and Grand Junction. It is a grand landscape, a vast ever changing landscape, formed over billions of years. Lisa Schoch-Roberts, in A CLASSIC WESTERN QUARREL: A History of the Road Controversy at Colorado National Monument, describes the landscape as “…one of constant change….change is perceived each day when the sunrise and sunset turn the sandstone a brilliant orange. The canyon walls are often dramatically spattered with desert varnish, an iron and manganese oxide that darkens the sandstone as if it had been rubbed with giant pieces of charcoal. Westbound on Highway I-70 towards Grand Junction, Exit 31 (Horizon Drive). Follow signs through Grand Junction to the east entrance. The visitor center and campground are 19 miles from the east entrance. Eastbound on Highway I-70 take Exit 19 (Fruita). Turn south on Highway 340 to the west entrance, which is approximately three miles from Fruita. The visitor center and campground are four miles up from the west entrance. Allegiant, American Airlines, Delta, United, and US Airways currently serve the Grand Junction Regional Airport. Amtrak provides daily service to Grand Junction. 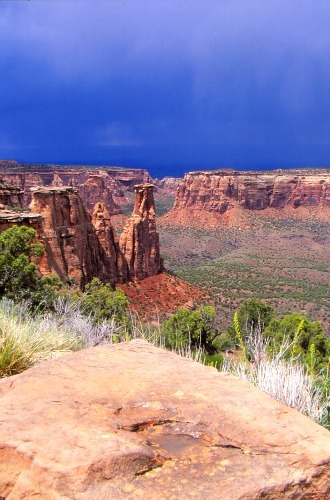 Books and Maps about Colorado National Monument may be purchased at the Visitor Center, or you may purchase them through Amazon.com by clicking the link below. The visitor center is open every day, except Christmas, December 25th. Visitor Center hours are SUBJECT to CHANGE! Good for seven consecutive days. Fees apply to those 16 years old and older. Entrance Fees are paid at the entrance station by credit card, cash or by check. If your fee is $25 or more you must include a taxpayer ID number on the check or the social security number of the person paying by check. All Federal Land Passes are accepted. Be aware that there are three tunnels on Rim Rock Drive. There are two tunnels on the west side and one on the east side of the park. The clearance above the lanes of traffic ranges from a low point of 11'5" two feet near the edge of the curb to a maximum of 16'1" above the centerline of the road. The length is 530 feet. The Upper west tunnel is 182 feet. Please keep your vehicle lights and/or bicycle lights on while traveling through the tunnels. 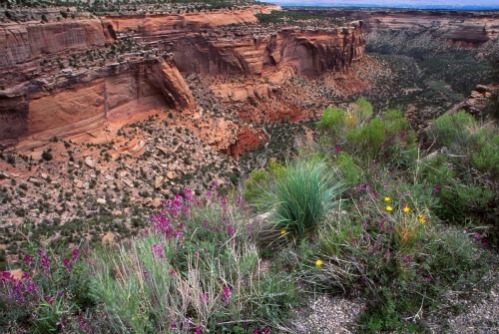 “A semi-arid climate dominates the Colorado National Monument and the Grand Valley below. 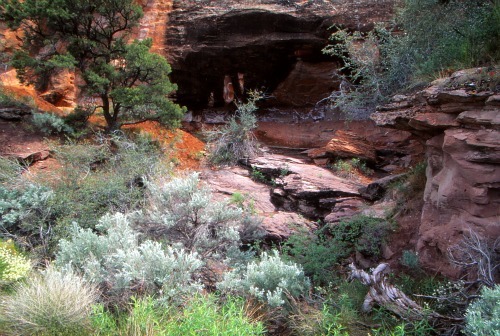 Rain is scarce, except for summer cloudbursts whose intensity has been known to wash out entire sections of the park's road and create temporary waterfalls that tumble from the canyon rims. Temperatures during the summer are highly variable with summer highs ranging into the low 100s. 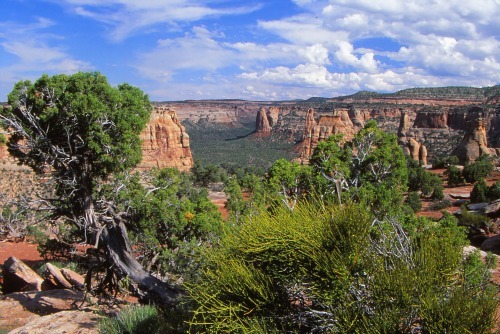 Activities with pets are limited at Colorado National Monument. •	To be walked in the park along paved roads. Pets must be leashed at all times when outside a vehicle. If you are traveling with pets, you may want to consider making arrangements to have them boarded in Fruita or Grand Junction. There are several places which offer boarding and/or pet-sitting services. “Canyon Country can be deadly for pets. Car temperatures rise quickly in the sun, even on cool days, your pet can easily die of heat exhaustion. If you are leaving a pet in the car, crack the windows as much as possible and leave water to drink. 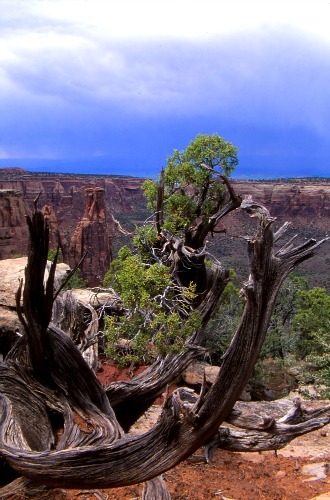 There are no restaurants or lodging within Colorado National Monument. However, the towns of Grand Junction, located near the east entrance, and Fruita, located at the west entrance, both offer fine dining and lodging. To find lodging in either of these towns, use the Search Box to the right. Simply enter the location and dates you have in mind, and the server, Hotels Combined, will provide you with a list of the lodging available on the dates you have specified. This is not a booking agency. It is a search engine to help you find great lodging at great prices. Saddlehorn Campground, just four miles from the west entrance (near Fruita, CO), is located near the Saddlehorn Visitor Center. It is the only established campground within the Monument and is open year round. •	$20.00 per night (payable at the self-registration kiosk at the campground entrance). •	Please bring cash or check to pay the campground fee. •	Generator use is prohibited from 8 p.m. to 8 a.m.
•	Checkout time is 11:00 a.m.
Pets are allowed at campsites, but must be leashed, well behaved, and attended at all times. You are responsible for removing pet waste and placing it in garbage receptacles. If you have only a few hours to spend at the monument, take time to visit the Visitor Center and to do the Rim Rock Drive. The National Park Service describes Rim Rock Drive as “…one of the most spectacular drives in the United States. Rim Rock Drive winds for twenty-eight miles between the park's western and eastern entrances in what the Grand Junction Chamber of Commerce described as one “….that would surpass in scenic attractions any other road in Colorado." 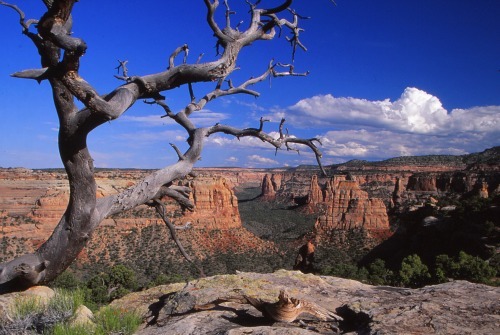 Colorado National Monument offers the visitor plenty of hiking opportunities, from short, easy trails with views of Monument Canyon to difficult hikes over steep, rocky terrain. For an excellent hiking brochure, complete with map, Click Here. Also, see the park service page on Short Hiking Trails which describes seven easy hikes, the longest of which are 1.5 miles round trip. 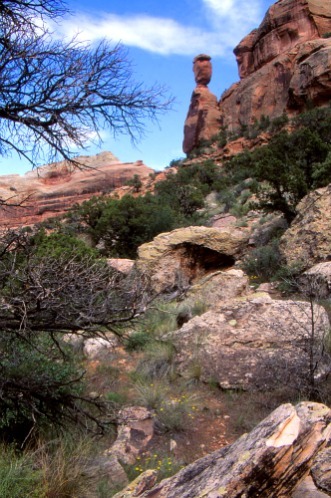 Those of you who would like to venture into the backcountry should also see Backcountry Hiking Trails for a description of seven different hikes. Although off-road mountain biking is not permitted in the monument, biking offers an excellent way to get your exercise and, at the same time, see the monument. “Bicycles or riders must be equipped with lights visible from the front and rear for safe passage through the tunnels. For additional information on biking within the Monument, Click Here. 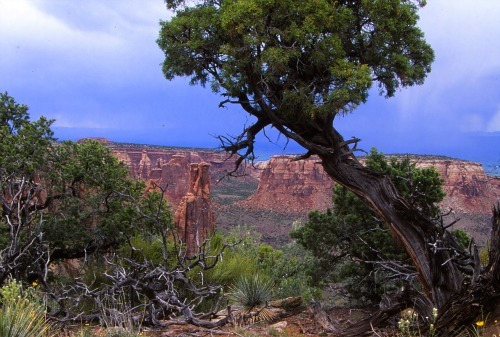 With its sheer spires, free-standing towers and vertical canyon walls, Colorado National Monument has much to offer the novice climber as well as the skilled technical climber. 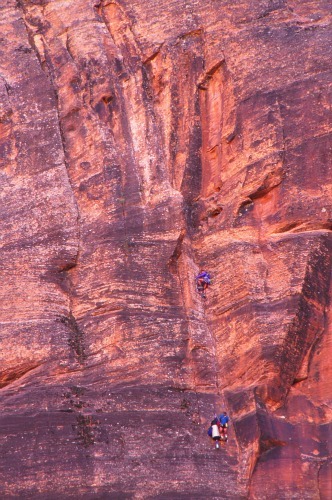 The 550-foot Independence Monument, first climbed in 1911 by John Otto, the park’s earliest promoter and first custodian, acts as a magnet attracting climbers wanting to duplicate his early feat. Each year, on the 4th of July, the United States flag is carried to the summit by local climbers, continuing a tradition established by Otto in 1911. Before attempting any climb within the park, it is important that you first stop at the Visitor Center to gather information on weather and current climbing conditions, restrictions and required permits. 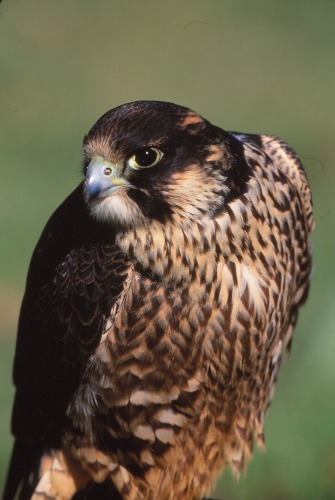 At least 54 breeding songbird species and nine breeding species of raptors have been identified in the monument. 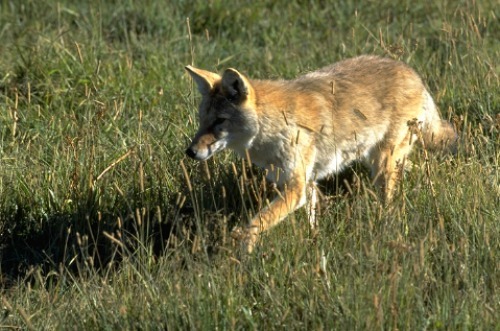 Several other species are known to pass through during migration and winter months. Reptiles are among the most conspicuous animals found in the monument. 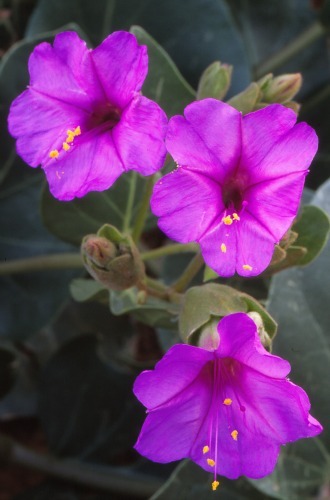 They are seen from early March through late October and are most active in May and June. 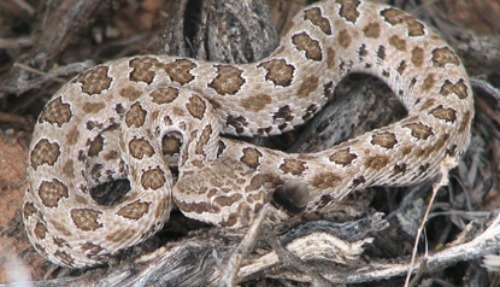 The midget-faded rattlesnake, a subspecies of the western rattlesnake, is the only poisonous snake found in the monument. Although several people were involved in the establishment of Colorado National Monument, one of the most improbable and most colorful promoters of the monument was John Otto. Otto came to the area in 1906 to work on the construction of a wooden pipeline designed to bring water up from Pinyon Mesa to the town of Fruita. When the pipeline was completed in 1907, Otto moved into nearby Monument Canyon and readily admitted to people “…I'm up in the Monument Park. I live in a tent and pay no rent." The promotion of Monument Park became Otto’s obsession, his whole purpose in life. It wasn’t long before Otto’s eccentric behavior led people to think he was crazy, and a hearing was held in Grand Junction to determine his mental health. According to the Daily Sentinel, which covered his hearing, they found that although he “…was given his freedom, he was not strong mentally." 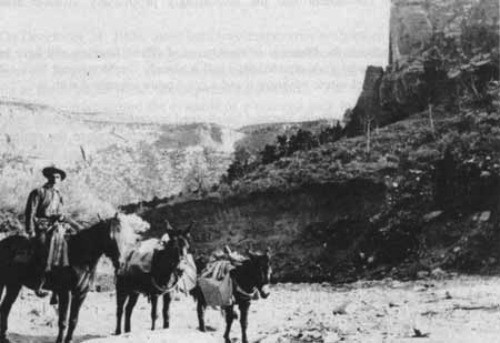 Not to be deterred by what people thought of him, Otto began building trails and inviting members of the Grand Junction Chamber of Commerce to come view the grandeur of the canyon. One of the men who offered “political assistance” was Edward T. Taylor, Congressman from Colorado, (D) 1909-1941. Taylor’s involvement in the establishment of the Colorado National Monument was important as well. In February, 1911, Taylor forwarded a petition signed by 300 citizens of Grand Junction and the surrounding areas to President William H. Taft. The petition called for “establishment of the Monument Park in Mesa County." In February, 1911, Taylor wrote to President William Howard Taft, enclosing a petition for the "establishment of the Monument Park in Mesa County" signed by 300 citizens of Grand Junction and the surrounding areas. At the suggestion of Congressman Taylor, John Otto was appointed as the park’s first Custodian at a salary of one dollar a month. This made Otto an official federal employee and authorized him to run the park; a job Otto took seriously until February 23, 1927, when the Park Service officially terminated him. 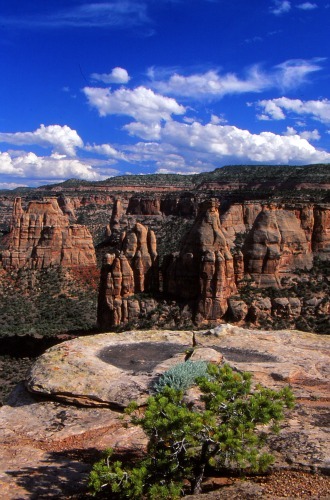 "The Colorado National Monument Visitor Center Complex in Colorado National Monument is an example of the park services facilities designed and built as part of the Mission 66 program. The complex includes the visitor center, designed by National Park Service architect Cecil Doty, the Bookcliff Shelter, designed by NPS architect Phil Romigh, and the Canyon Rim Trail, designed by NPS landscape architects Babbitt Hughes, and built between 1963 and 1965. The structures follow the precedent set by earlier park structures by using native sandstone laid in a random ashlar pattern." In a departure from the rustic-style buildings constructed by the Civilian Conservation Corps (CCC) for the Park Service in the 1930s, Mission 66 designers embraced a contemporary structural form for the new centers. 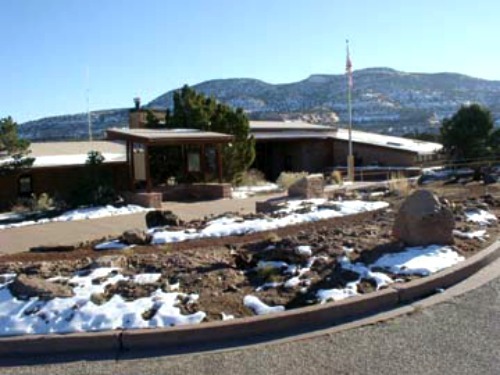 Although the Visitor Center Complex is less than 50 years old, it is eligible to the National Register under Criterion Consideration G as an exceptional example of NPS Mission 66 planning and Park Service Modern Architecture in Colorado.